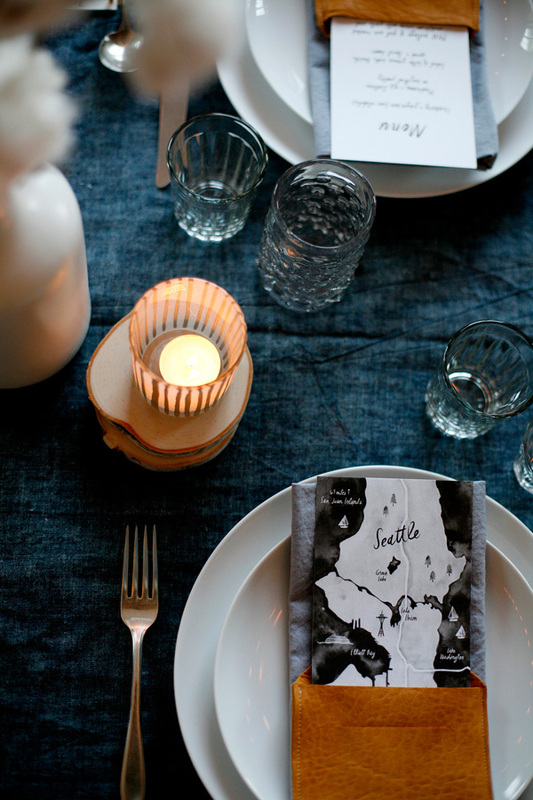 SCOUT blog : Jenn Elliott Blake | A Cozy Evening. 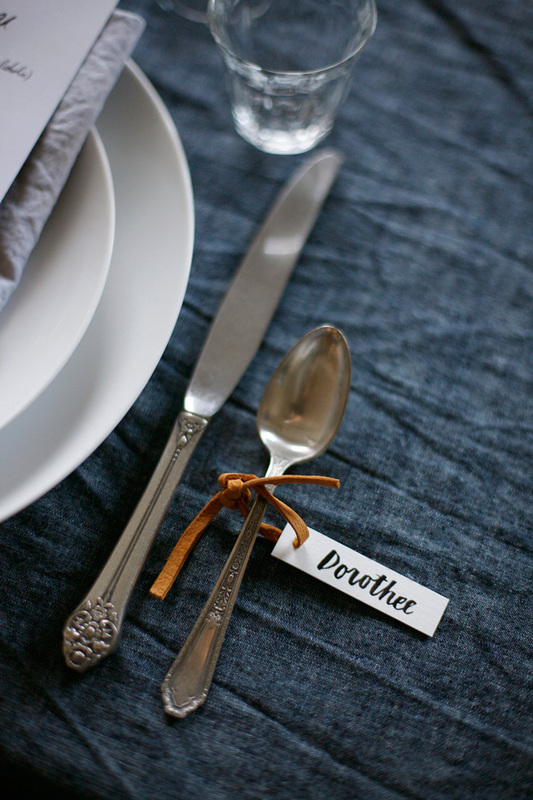 I’ve been so eager to share a few of the images Dorothee captured during our lovely winter’s evening back in January. The day actually turned out to be quite spring like (sun and warmer temperatures than we expected) but the dinner celebrated the quiet, calm darkness of a chilly winter night and the beauty of sharing a meal with others. 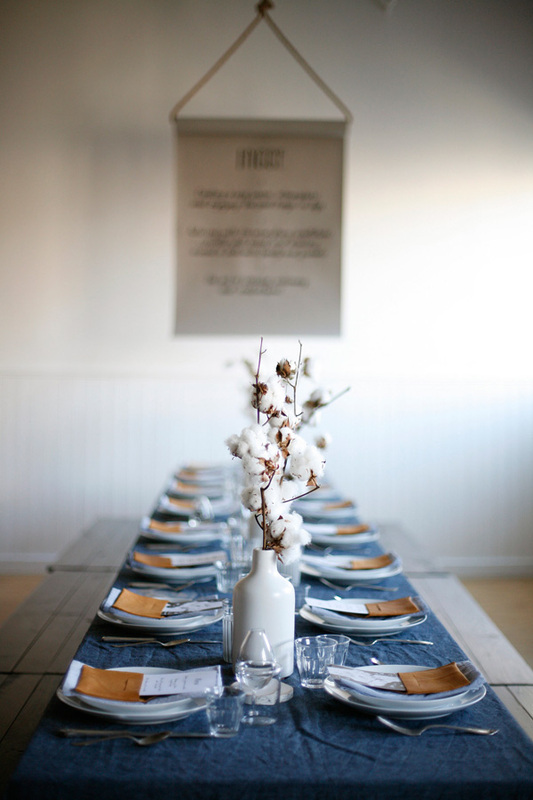 Aran’s bare palette studio space was the perfect setting for a dinner we hoped to reflect the simplicity of good company. We used the term “hygge” (I’m obsessed with its various definitions & meanings on this site) to inspire much of the evenings personality including the menu itself. 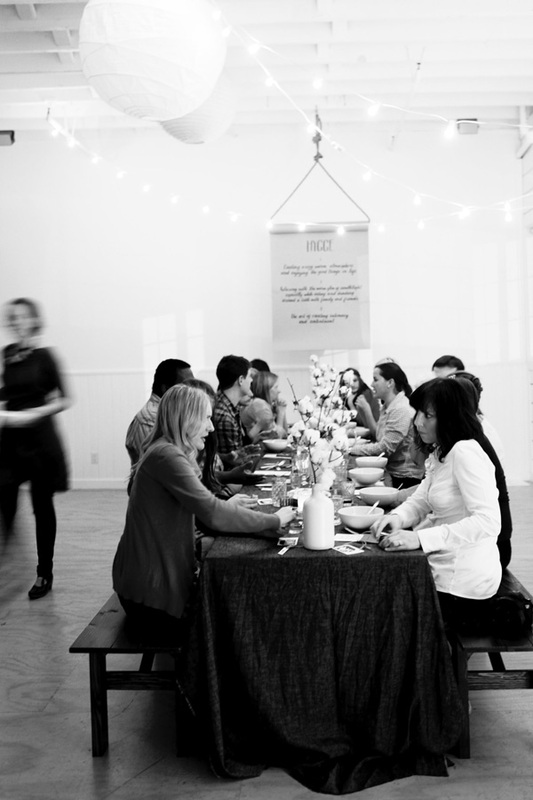 It was a privilege to style and design the evening alongside some of my most cherished Seattle friends. Aran did such an amazing job with the menu and I was endlessly impressed by how gracefully she taught the students to concoct each dish. I learned so much from her throughout the evening and was constantly awe-struck by the beauty of each recipe. Dorothee was a constant cheerleader throughout the entire planning process and was so much fun to work with throughout the night. Her photography consistently takes my breath away as it so accurately captures the light and mood of any event in the most classic & wonderful way. My dear buddy Julia did an amazing job on the paper details we dreamed up together. 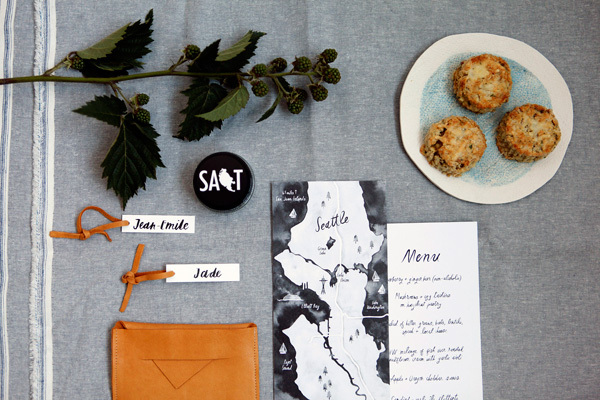 Her hand illustrated type and amazing graphics skills made the Seattle map inspired menu come to life and pop right off the table. How crazy amazing is that watercolor menu eh?!! I was blown away by how many custom type options she sent along during the planning phase, and seeing the final pick in person made me squeal with glee. The girl is so bananas talented. I mean who other than Julia could hand paint that Hygge poster in one run? Wowza!! I’m so blessed to have had Julia along on this tabletop design. I’m so inspired by her work and endless talents. And then there is Keli of Drygoods Design. Oh lovely Keli let me count the ways! Those little leather pouches would never have come to life without Keli’s touch. I often come up with harebrained ideas that seem so unattainable and unrealistic in the moment, but leave it to Keli to help make my wildest design dreams come true! We spent an afternoon picking out soft and buttery leather hides at an amazing leather shop in the International district of Seattle, and then spent an evening together cutting and sewing the wee little pouches to life. I was so so overwhelmed with joy by how well they turned out, and was so eager to get them in the hands of the attendees the night of the dinner. I love creating design details that serve a plethora of purposes, and loved that the pouch not only housed the menu during the meal, but could be taken home and enjoyed as a coin purse, business or credit card holder or whatever else could be imagined. 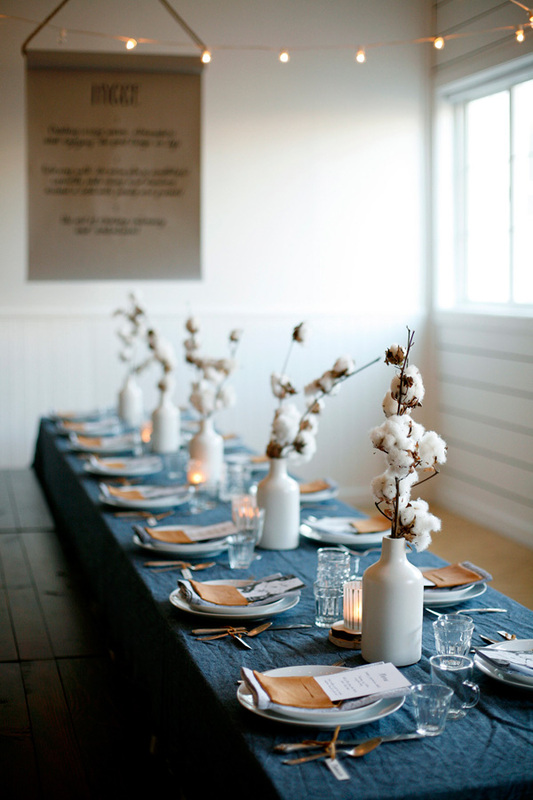 We also nabbed the gorgeous chambray fabric we used for the long table linen from Keli’s shop as well – I’m telling you – if you’re ever in Seattle make sure to swing by Drygoods! 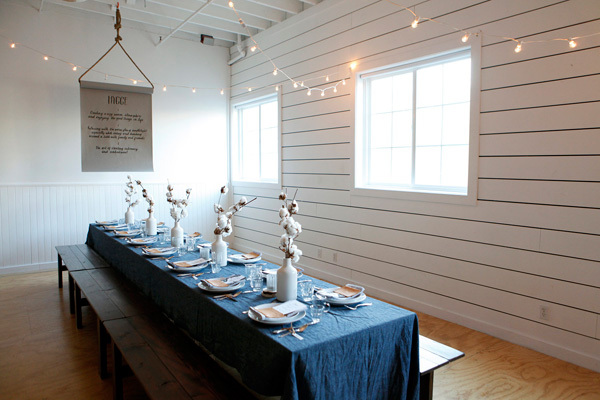 The beautiful wood benches were a treat from the lovely folks over at Seattle Farm Tables. Their barn wood benches were the perfect counterpart to the overall design. I wanted the seating option to create a “cosy” vibe and the dark finish boosted the moody ambiance. I will definitely be reaching out to the them for many more events down the road. So thankful for their generosity and so impressed by the quality of their craftsmanship. Thank you Azure and Mike! Katherine over at Marigold and Mint (one of my most FAVORITE floral shops in all of Seattle) so kindly provided the floral elements for the evening. 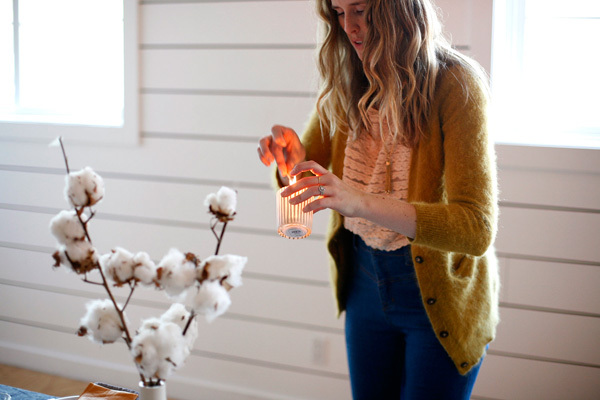 I was so eager to use some of her amazing cotton flowers for the tabletop and went into complete panic mode when she told me the cotton was nearly out of season. But thankfully she worked her magic and was able to special order some for me the week of the dinner. 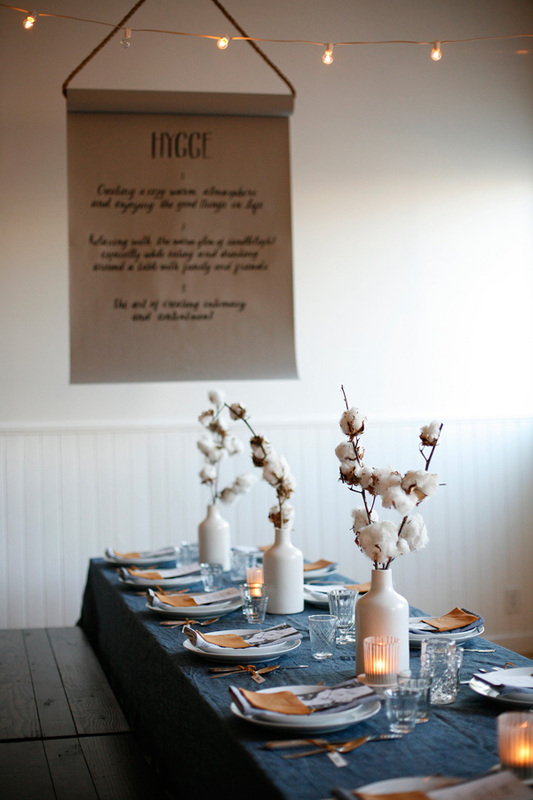 The cotton was that soft texture I wanted to offset the harsher wood and ceramic elements. Hallelujah! 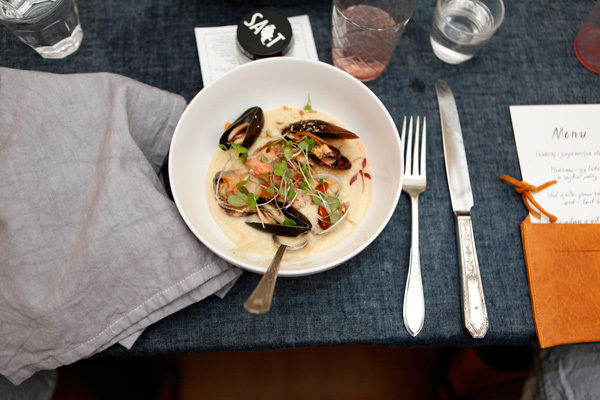 The evening was caped off by the beautiful salt donated by the San Juan Island Sea Salt Company. The uniquely designed little jars and the course grey salt are so beautiful (I can’t wait to get cooking with it once our kitchen is remodeled!) 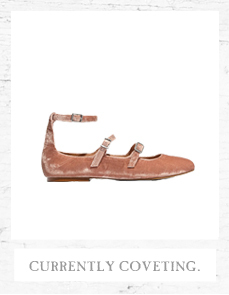 and I was so excited to include them amongst all of the pretty details. Thank you so much to everyone who spent the evening with us. It was so much fun getting to know each of you and we are so appreciative of your new friendship! 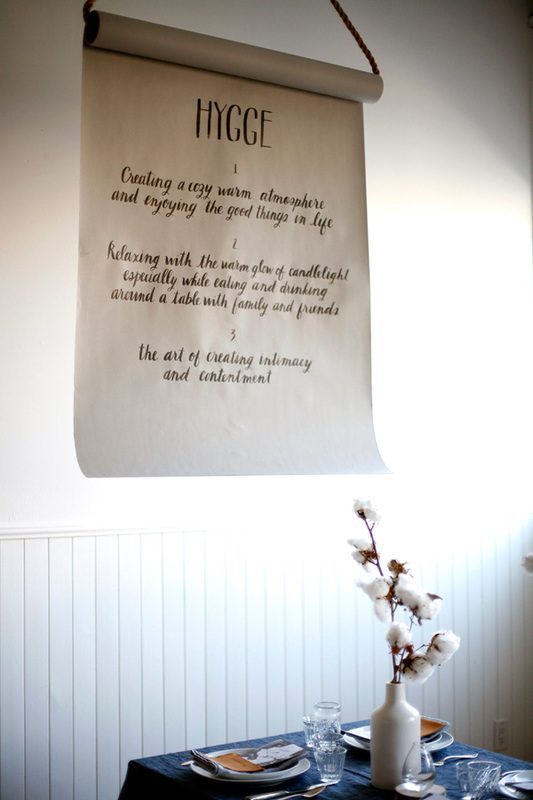 Stay tuned as Aran will be hosting many more lovely dinners and workshops in her studio space in the weeks to come. You can see all of the upcoming events here. 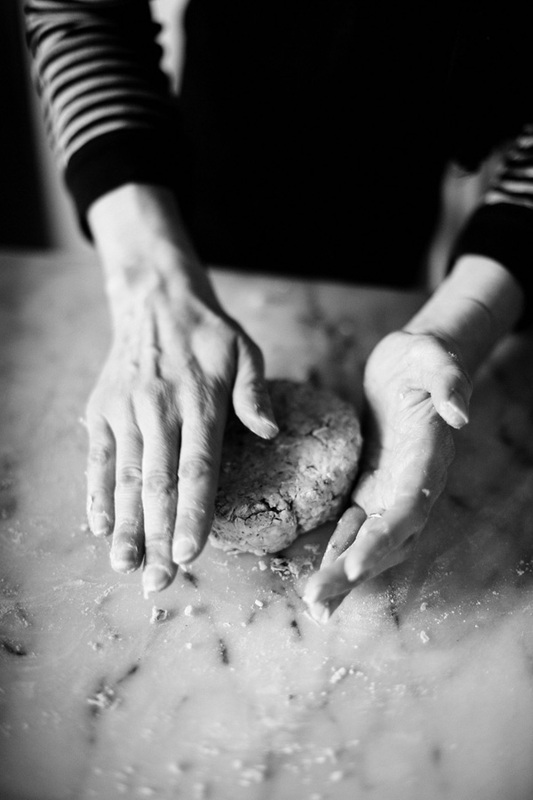 You can also find many of the recipes from the evening over on Aran’s beautiful blog. photography by Dorothee of Belathee Photography. Lovely post and such beautiful images. 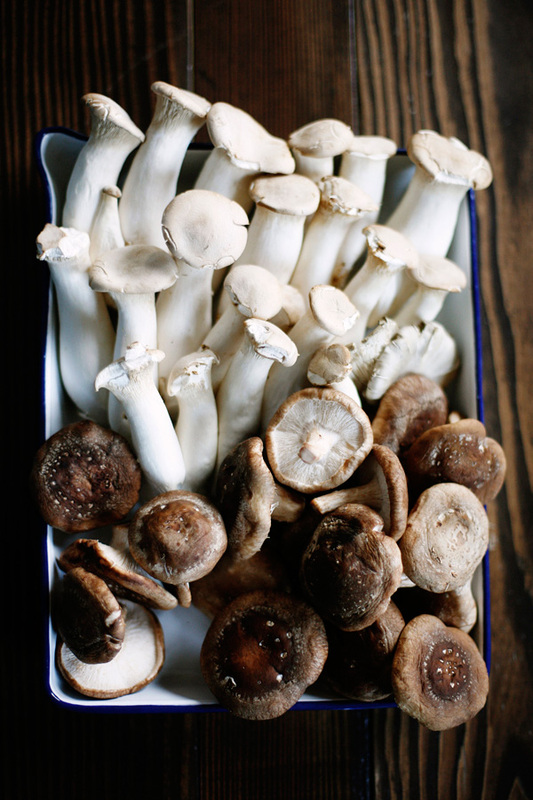 You did a stunning job of styling the dinner. The fine touches are beautiful. so, so, so lovely. though i’m a bit tired of this dreary weather and ready for spring! It’s just so perfect! 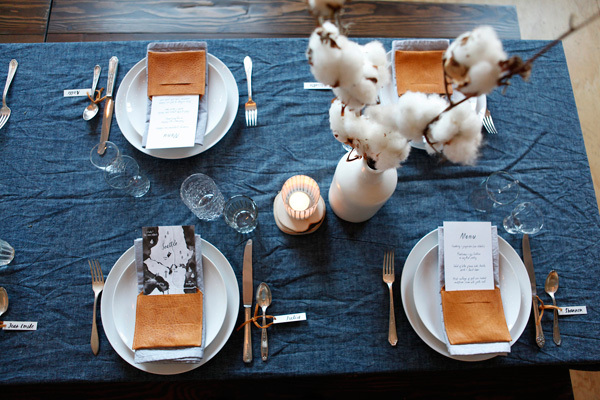 That vertical shot from the end of the table with the cotton in focus is an absolute dream. Beautiful work! Jenn, this is gorgeous!! Oh how I wish we lived closer so I could be surrounded by your beautiful creations! SCOUT blog : Jenn Elliott Blake | Creating in Color.